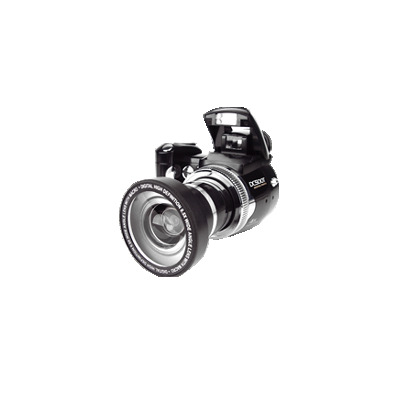 Successfully Added Multifunction Pop-Up Flash Zoom Digital Camera Wide-Angle Lens to your Shopping Cart. Awesome looking high performance digital camera and camcorder combo with a pop-up flash and an included removable screw-mount 0.5x wide angle lens for taking wide angle pictures. This camera will take great quality images of 5 Mega Pixels with up to 12 Mega Pixel pictures available via interpolation. Also notable with this factory direct pro-level digital camera is the large 2.4-inch LCD TFT display for a bright preview of your pictures and movies, SD/MMC memory card slot, 640x480 movies at 30 FPS, and a great selection of included accessories such as a camera tripod and high quality carry bag so that you can start using this camera right away. A low factory direct wholesale price and great features make this a deal that you should not miss. Buy one for yourself and buy 3 more to sell on eBay or your own internet storefront - a great way to make some extra money for yourself and also share the joy of the latest in high-tech electronic gadgets. Order yours today! i cant wait to receive mine that i have purchased!!!! on 2009-06-10 02:44:40 Very COOL Camera!!!! I am very pleased with the camera.I am a jewelery designer and I made the photos from my website with this camera.You can have a look http://www.akoya-pearlandcrystal.com. i like the way its designed. i think is the best on my list as now and i think its the hit.